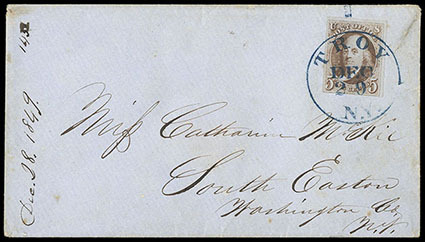 1847, 5¢ red brown, horizontal pair, four margins, strong color on deeply blued paper, tied by red circular grids on blue 1851 folded cover from the Whelan correspondence to Philadelphia Pa., matching "Saint Louis Mo. '10' Jul 1" integral cds, Extremely Fine; with 1990 P.F. certificate. Scott No. 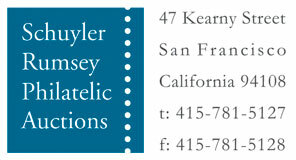 1 Estimate $7,500 - 10,000. ONE OF ONLY TWO RECORDED 1847 ISSUE COVERS USED ON JULY 1ST, 1851, THE FIRST DAY OF DEMONETIZATION. This was the first day on which the 1847 issue stamps were no longer valid for the payment of postage, according to the demonetization of June 11, 1851. 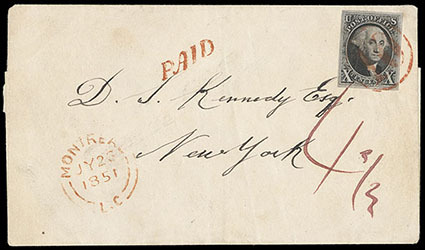 The other July 1st, 1851 cover was used from New York City. 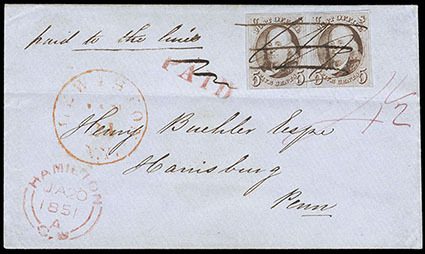 1847, 5¢ red brown, horizontal pair, large margins to clear, tied by pen strokes on blue 1851 cover from Hamilton, Canada to Harrisburg Pa., clear strike of "Hamilton C.W. JA 20, 1851" origin cds at lower left, magenta "4½" pence indicates Canadian postage paid in cash, "PAID" handstamp applied at Hamilton crossed out and with manuscript "paid to the lines" at top, "Queenston U.C. 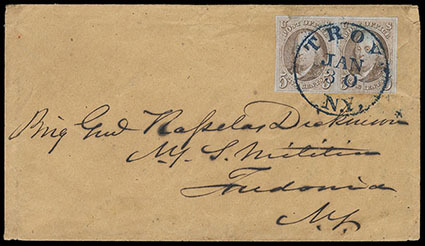 JA 21, 1851" backstamp, red "Lewiston N.Y. Jan 21" cds; partial flap, small stamp tears, a Very Fine and rare 1847 Issue cover originating in Canada. 1847, 5¢ red brown, ample margins with separation cut in lower left margin, tied by large manuscript Roman numeral "X" on 1850 folded letter to Philadelphia, Pa., red "Lansingburgh, N.Y., Sep 21" origin cds alongside, Extremely Fine; with 2018 P.F. certificate. A WONDERFUL ROMAN NUMERAL "X" CANCELLATION IN MANUSCRIPT ON A 1847 5¢ ISSUE FROM LANSINGBURGH, N.Y. This is one of three recorded usages of the 5¢ issue from Lansingburgh, N.Y. (with only one 10¢ usage known) and the only example bearing this unusual manuscript cancel. This may have been a provisional usage to uprate the cover to 10 cents for a double rate to Philadelphia due to a possible shortage of 10¢ adhesives. The Alexander book records 1200 5¢ adhesives being sent to Lansingburgh and only 100 10¢ adhesives. 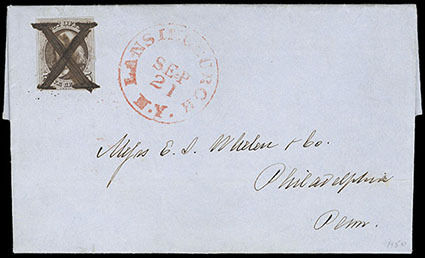 1847, 5¢ red brown, horizontal pair, ample to large margins, tied by bold blue "Troy, N.Y., Jan 30" cds on cover to Brig Genl Rapelas Dickinson in Fredonia, N.Y.; right stamp with a couple natural pre-printing paper wrinkles, Very Fine and choice. 1847, 5¢ red brown, clear to huge margins, strong bright color, neatly tied by blue "Troy, N.Y., Dec 29" cds on cover to South Easton, N.Y., Very Fine and choice. 1847, 5¢ dark brown, vertical pair, clear to large margins, tied red paint grid cancels, matching "St. Louis Mo. 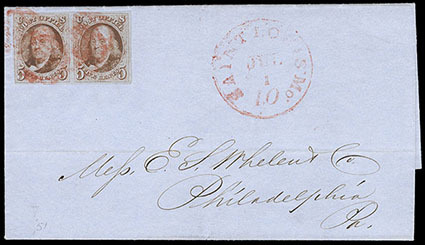 '10' Oct 9" integral-rate on gray folded cover to Philadelphia Pa., Very Fine; with 2011 P.F. certificate. Scott No. 1a Estimate $1,500 - 2,000. A RARE AND CHOICE USE OF A 5¢ DARK BROWN VERTICAL PAIR ON COVER. 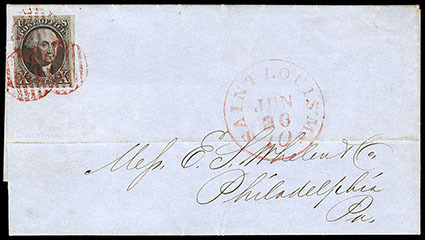 1847, 10¢ black, position 17R, large to huge margins, detailed impression, tied by three strikes of red enclosed grid cancel, matching "Saint Louis Mo. '10' Jun 26" cds on blue folded cover from the Whelen & Co. correspondence to Philadelphia Pa., Very Fine; signed Ashbrook and Frajola. A CHOICE 10¢ 1847 STAMP ON A BEAUTIFUL COVER FROM THE WHELEN CORRESPONDENCE. 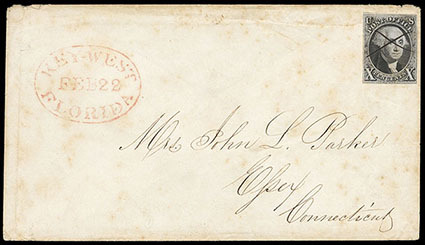 1847, 10¢ black, ample margins to just in, cancelled by manuscript "X", red "Key West Florida Feb. 22" oval datestamp on cover to Essex Conn.; cover some light toning; some slight edge wear, Fine and rare Florida use, ex-Eubanks. ONE OF ONLY FIVE RECORDED 10¢ 1847 COVERS FROM KEY WEST. Key West was served during this time period by the steamer "Isabel" on the Charleston and Havana route. 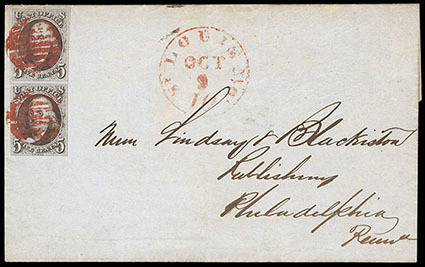 1847, 10¢ black, large margin single on cover which appears to be sent from Montreal, Canada to New York, with all markings and address on cover forged, Extremely Fine appearance, rare gem appearance.